As some of you may have seen from our Twitter feed, I was in Amsterdam a couple of weeks ago on business (there are worse places to be sent to a conference, eh?). I must admit that Amsterdam opened my eyes in many ways to a lot of things, however a lot of those stories will be taken with me to the grave… but I digress. 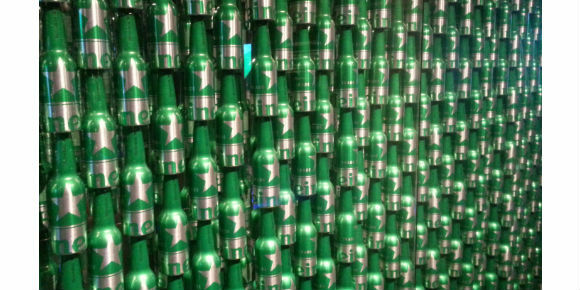 Aside from such cultural sights as the Van Gogh Museum, Anne Frank’s House, the Rijksmuseum, the canals, Vondelpark and the old town, I also took a couple of hours to tour the Heineken Experience. The Heineken Experience sits just to the south of central Amsterdam and is on the site of the original brewery which opened in 1867. 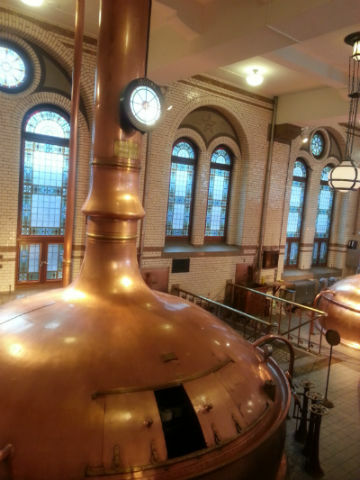 This brewery produced Heineken right through until 1988 when a much larger, more industrial and efficient complex was built further out of the city. The entrance plays on the historical side of the brand; everything looks quaint and old school, there is no bright green advertising and you begin right back in the 1860s. There is a fantastic collection of early bottles, beer mats, awards and old documents, including the famous ‘All or Nothing’ letter. 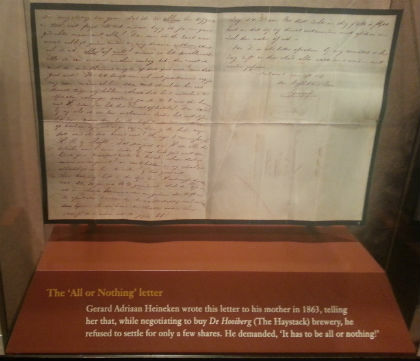 This is a letter sent by the original Mr Heineken to his mother in 1863 in which he shows his disgust at being offered just a few shares in the Haystack brewery (the name of the brewery before it was Heineken). He demands to buy the whole brewery, and that he wants all or nothing. Eventually, of course, he would get his way. Just round the corner, you learn about the creation of the ‘A’ yeast strain by Dr. H Elion who was a student of the famous Louis Pasteur – this strain is still used by Heineken to this day. Further on, you go into the old brew house with its mashtuns and lautertuns. The walls are very decoratively tiled and the place still has a lovely 19th century feel to it. 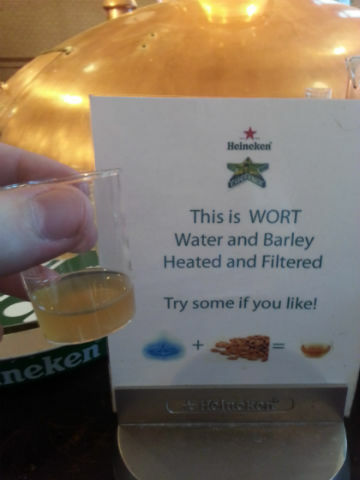 There’s a chance to try the wort before you move on and encounter the famous Heineken shire horses. In the early days, these horses (or rather their ancestors) were used to transport Heineken around the city of Amsterdam to all the various drinking dens. Nowadays, they’re still used but in a less functional much more touristy way – you can take a horse drawn carriage ride around Amsterdam with one of these horses should you so wish. It’s at this point that the historical part ends and the corporate green machine really clicks into gear. Massive plasma TVs, state of the art visual displays and interactive gadgets are soon ten a penny as you get the chance to bottle your own Heineken, test out your pint pulling skills and even play football against your mates on a PS3. It’s easy to see there was no expense spared during the year-long revamp in 2007/08. 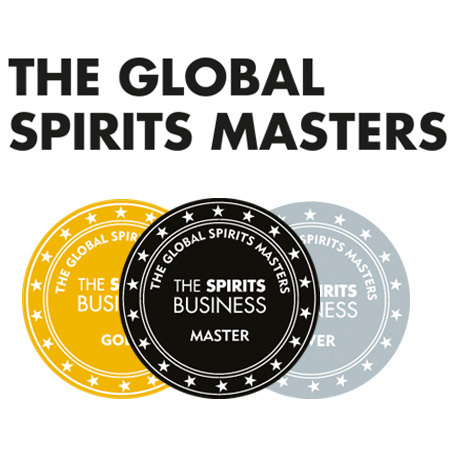 Each visitor is given two tokens to redeem against drinks in the bar at the end of the tour. Despite this being 2pm on a Monday afternoon the place is packed, the music is blaring and everyone is (responsibly) enjoying their beers. Overall it’s a great visitor experience, and pretty good value for 18€. It might not have the high brow draw or cultural appeal of the Van Gogh Museum or Rembrandt’s House, but it’s certainly something to see when in Amsterdam. This entry was posted	on Monday, September 16th, 2013 at 1:31 pm	and is filed under Musings. You can follow any responses to this entry through the RSS 2.0 feed. Responses are currently closed, but you can trackback from your own site.